Vonnie's Aunt Lillian and Uncle Bubba Hanna lived on the farm next door. 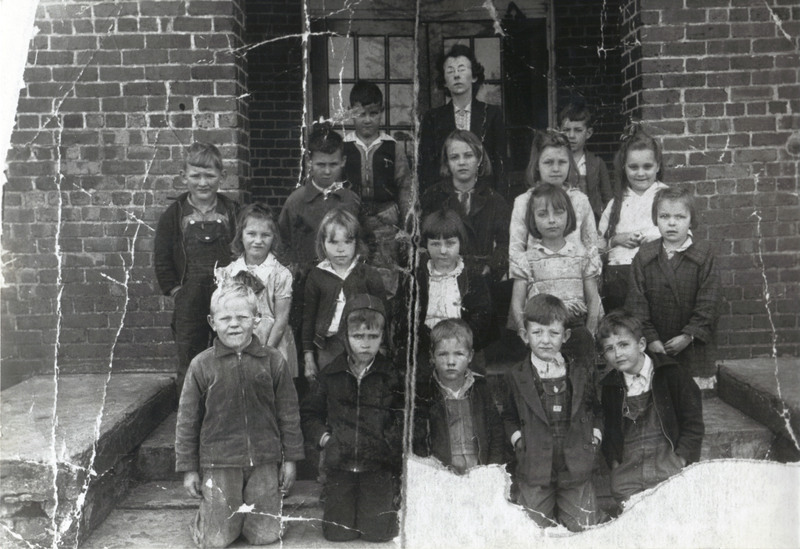 Johnsonville First Grade, 1941. Vonnie is 2nd row, 2nd from left. Carter Family gathering: Vonnie (front, center) holds hands with grandmother Octavia Stone Carter, 1938. 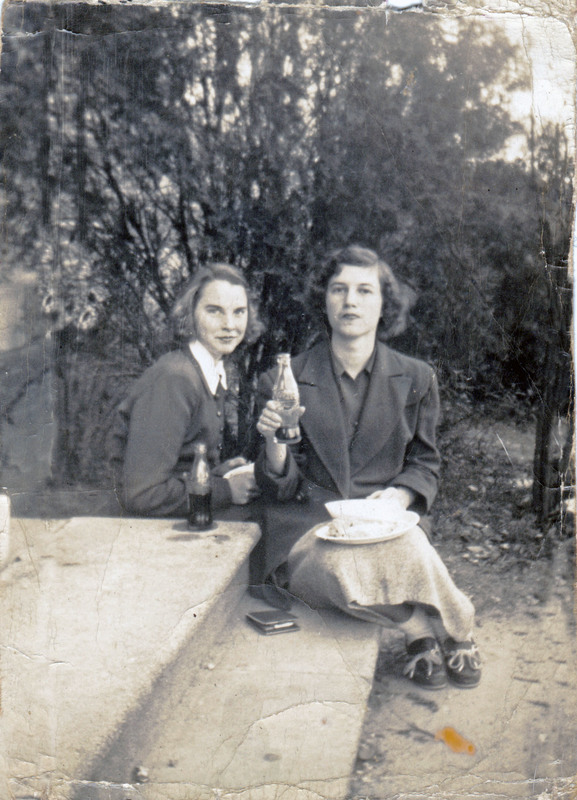 Vonnie and Wera Nell Prosser share a coke outside Johnsonville High School, 1953. 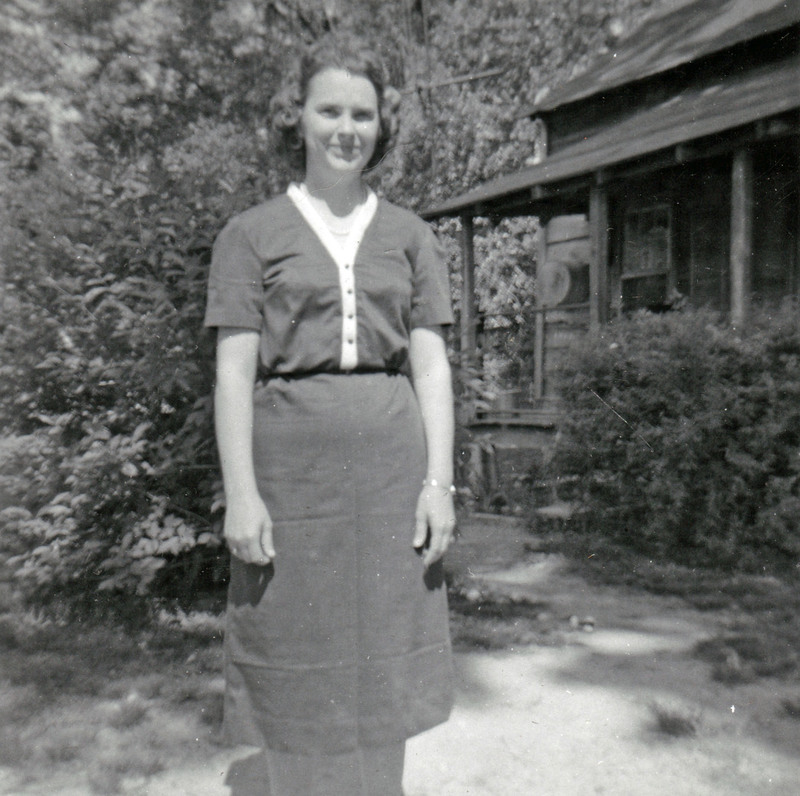 Vonnie in front of her old home on Arles Road off Vox Highway. 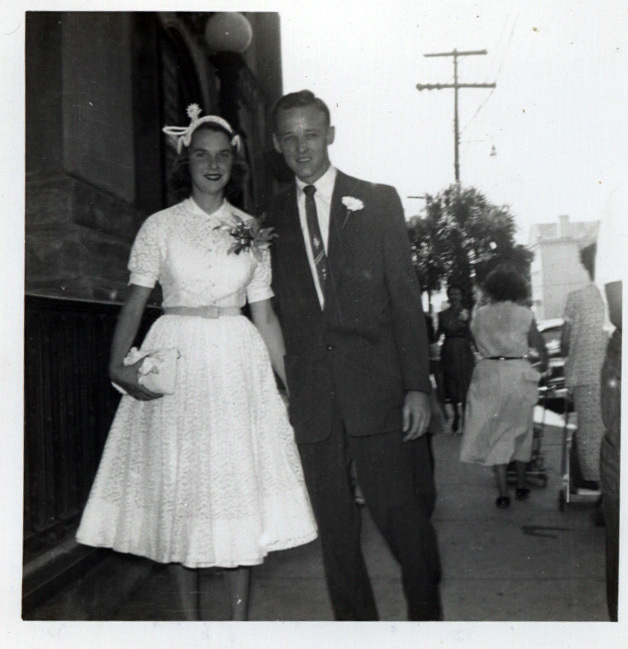 Joe and Vonnie Dukes on their wedding day in Charleston, 1955. Yvonner Leta "Vonnie" Hanna was born on Feb 22, 1936. 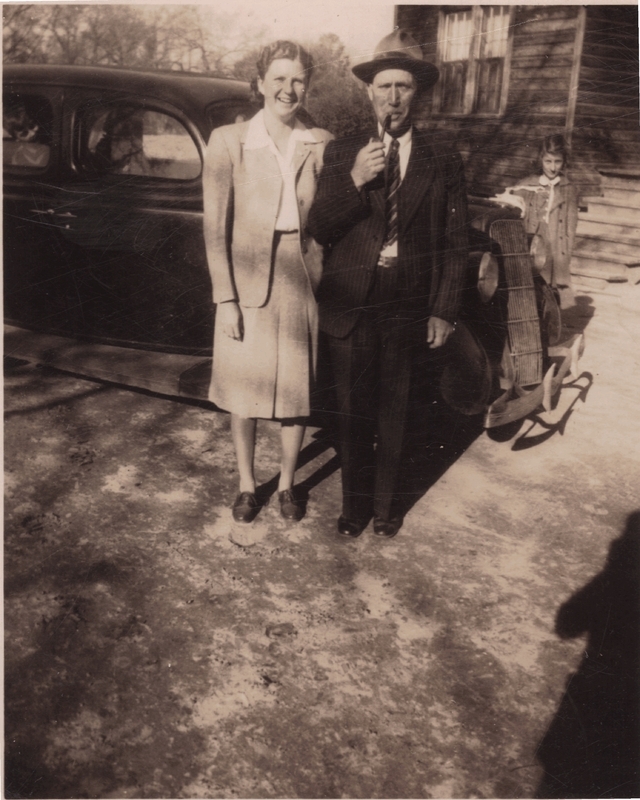 She was the middle child and only daughter of Arles Timmons Hanna and Violet Elizabeth Carter. 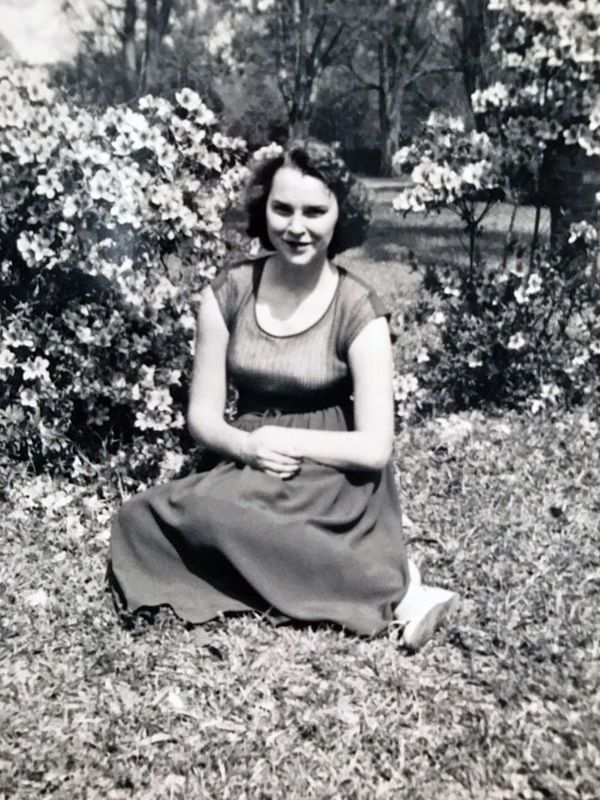 These stories of her childhood and experiences in Johnsonville were told in her own words and compiled by her grandson Josh Dukes over serveral years. I don't know where Mama and Daddy got married. I believe they may have just gone to the justice of the peace. They didn't have a wedding or anything like that. They have a marriage license though - I still have the certificate. Mother graduated from school, but Daddy didn't. Uncle Bubba Hanna went on through. Now, I can't see how Granddaddy could let one go through but not all of them, but Uncle Pete did too. Mama went to school at Vox and Vox only went to like 7th grade. Then they'd go on to high school at Johnsonville and she graduated in 1927. Lillian graduated from Johnsonville, too. Doctor Ulmer delivered me and Jimmy, but I'm not sure about Vander. His office was in Hemingway - right there where the little Weekly Observer building is. When Steve was little, he had pneumonia, and Doctor Ulmer came out there just about every day. He told me "don't you even let him go from one room to the other." He gave him penicillin shots just about every day. He always called me one of his children. When I graduated from high school, he bought me nice pajamas with a little housecoat thing that went with it as a present. The earliest thing I can remember - I can remember, back at the old house one Christmas, I must have been real, real young. I wanted some water. I stepped out of bed and went into the kitchen. And, I didn't know that Santa Claus had come. We didn't get electric lights until I was about 5 or 6. Santa Claus had come, and they got me a little teeny piano. And, I stepped on that piano! It made noise, and they all come to see what was going on! I banged on that little piano for 2 or 3 years! Another one, I remember hearing [my aunt] Edna say that the year [my brother] Vander was born on Christmas Eve, her and Aunt Esther didn't get a present until the day after Christmas. My Granddaddy, he had picked out some dolls he was going to get for them. But see, mother went into labor, and he made his extra money by hunting and fishing. He'd caught a couple of otters and he'd gotten the skins for them - he was gonna get a little piece of money for them. When mother went to labor, he didn't get to the store until the next day, so they got their presents late. Vander was their little Christmas present, though. Bubba Hanna lived down that long lane over there, and him and Lillian didn't have children. They'd be the first ones over here to see what we got for Christmas. On Christmas Eve night - I didn't do much fireworks, but Vander would. He'd watch out our window, and Lillian would come out of Granddaddy and them's house over there where she and Bubba lived and would start popping her fireworks, and Vander would answer her in our yard. They had those things that went up in the air - bottle rockets. And she'd stay on her side and he'd be on ours, and they'd just shoot those things at each other. You didn't know Lillian back when she was young like that. They would always be the first ones to come Christmas morning. And I know I've told you this, but we had an old red rooster. Every time he'd get close to me, I'd bump him with my bicycle. I've got a scar on my leg from one time when he fought back! Mama had asthma. In the fall and winter when she had asthma so bad, Daddy would do the cooking. I never remember my Mama getting up and fixing breakfast for us - it was always Daddy. She would cook during the middle of the day, and most of the time we would eat the same thing, leftovers at night. A lot of times if they wanted something different at night, she would fry chicken, make chicken gravy, fry fish, or stuff like that. If she had company coming over, she'd fix supper. She didn't do this too often, but sometimes she'd fry chicken and make gravy and then put the chicken back in the gravy, and she'd make grits to go along with it. I've never been able to get mine to taste just like it and I haven't found anybody else to do it either. She'd make it in a big ol' iron frying pan. There ain't nobody could make dumplings like Mother could. She rolled out her biscuit dough, but she put eggs in hers. She'd roll them out on a piece of plastic or something and she'd cut them. And they had grits every night just about. Bubba had sugar cane over at his place. We carried grits up to Blackwell's mills, and we carried flour over to the crossroads - you'd take wheat there to make flour for biscuits. When I was in school, there was only like 16 that started at Johnsonville. The others, they came from Old Johnsonville, they came from over there at Kingsburg, and they came from Vox. I started at Johnsonville and I graduated from there. There was me and Horace Browder, Mary Hanna, and I know Blanche Lee Haselden, and Johnnie Mae Ard, Mary Carol Strickland, Betty Jean, Wera Nell Prosser… I can't think of the boys' names. I didn't walk to school, the school bus stopped and picked me up. I walked down that long lane to the road out there. Those few months that I played basketball on the main team until they made me drop out, I walked. Now Daddy had a car, but I would stay after school to practice. And I'd have to walk from school like about 5:00 in the evening, home. When they made me quit to stay at Grandmama's, it was in the fall and it was starting to get dark early. I remember the last time I walked home I was so scared. And I just can't imagine a man letting his daughter walk home like that! Vox Highway was paved by then. I can remember going to Grandmama Carter's house and that place wasn't paved up there at her house on the Vox Highway. Jimmy was in grammar school when it was paved. I remember Mama couldn't get him to stay in and study for nothing because he'd go out there and watch those machines. The road plows, the paving machines and all that stuff. And he was just fascinated with it. Now my Grandmama Carter was mean. They didn't treat kids like they do now. They thought kids, they were supposed to be - just get them out of the way so they won't be around the grown people, you know. Another thing, Grandmama, they would beg me to come up and stay a week. Well, during the day they would send me out to help gather tobacco. Alright, at lunch time, Grandmama would send me out to pick beans or peas out during the hottest part of the day. Then, she'd sit there and shell them while I went back out to work tobacco again in the afternoon. Daddy found out about that and he said, "well, you ain't goin' back no more, then!" That's why they give you a break from tobacco in the middle of the day, cause they feel like it's the hottest part. But I guess she figured me being a child, it didn't matter… well, I was a teenager, actually. You had to do what they told you. I used to have to stay up there every other night during the week, that was in 9th grade, 10th grade, and part of the 11th. She would make me some kind of eggs of a morning. It seems like she would fix it on toast, but seems like she only used the yellow of the egg. I guess she used the white for something else. I used to get so mad - they didn't have a bathroom inside, so I always had to take out the old pot from the bedroom and wash it! And on top of all that, they made me clean Grandmama's teeth. And I could not stand that! She had false teeth - I had to take those things and clean them. Another thing that made me so mad - Uncle Briley and them lived in Charleston, and Precious and them would come down sometimes to visit. Well, Edna would make me stay there with Grandmama, and her and Precious would go off all over everywhere! Then when Grandmama died, Edna picked out the best quilts that Grandmama had, and she sent them off to nieces that lived off, California and other places. The ones who never did stay with her! I told Edna about that before she died. She said, "I did not do that!" and I said "you did, too!" Grandmama used to clean out one of her bedrooms, and she'd put all that dried tobacco in there when they'd take it out the barns. She'd sit there and braid and tie tobacco. They had one of those old potbellied stoves in the kitchen. And in the living room, they had one of those old potbellied heaters that burned coal. I used to have to tote in ol' buckets of coal. Tote coal and empty the slop jar. They had a big ol' bull dog - they called him Bully. They figured he was their protection, but that dog was so lazy he'd hardly even bark, much less protect anything. I've heard stories about my Granddaddy Carter - he died before I could remember, but I've heard that he liked to scare people and play tricks. Evelyn and Annie Lou, my Uncle Olin's two youngest girls… he was coming back from fishing at the river and he seen them going out looking for the cows. People used to just let the cows graze all day wherever, then at night they would go out and have to drive them back in. Well they were doing that and he must've seen them. He hid, and when they got up he must've made some kind of noise and scared them. When they go closer he jumped out so they could see who it was, and they cussed at him. Uncle Olin found out and he was about to punish them. They said Annie Lou looked at him and said, "Well if Uncle Morgan Ham ain't got better sense then to scare us like that, I ain't got better sense then to cuss him!" 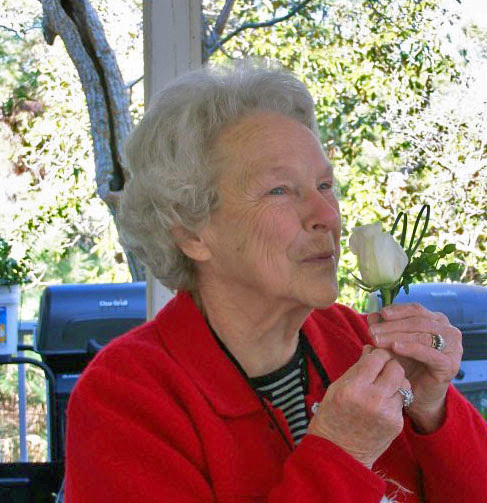 Granny's cousin Betty Lou remembered Granny's other grandfather, Thomas Franklin Hanna: "Uncle Thomas liked to dance. On Saturday nights, when the Grand Ole Opry would come on, they would all go to Uncle Barney's. He would dance and sweat and just cut up. Granddaddy Hanna drank a lot too. When he got sick, they took him to the hospital, and about time they did surgery, he died. My daddy always regretted that he didn't get to the hospital before he died." Uncle Barney would have get-togethers once or three times a year. Everybody would fix food and they'd bring it over and they had a flatbed truck. They'd sit around and eat and cut up. There was a radio that was on the table. When I was a little girl, I went to look under the house to see if I could find the people that were singing on the radio! I had to get clued in that they weren't IN the radio. I've heard the story of the Walking Boss all my life. Where Bubba Hanna's house was, my grandparents - actually, my great grandparents used to have a big ol' two-story house there. My Mama and Daddy and all of 'em said they'd go in the house and there wouldn't be anybody in the house but they'd hear somebody walking. They'd follow them from one room to the other but they never could see nobody there. They said that upstairs there was one bedroom, said that you could lock that door, and it would just swing open. You couldn't do anything to keep that door locked and closed. And then Uncle Pete - now Uncle Pete was probably drinking - but he said he saw him. He said it was a little boy and he would chase him, from tree to tree when they were curing tobacco. We had benches - tables - under the barn shed. They would fire the tobacco with wood - this was a long time ago! They would take a pillow and a blanket like and they'd sleep on those tables, then they'd wake up and fire the tobacco again. Uncle Pete said he was sleeping out there and one night the Walking Boss pulled the pillow right out from under his head. But I asked Uncle Pete if he was drinking that night! Daddy said that he had heard it over at Granddaddy's house, but he never had seen anything. Uncle Pete was the baby of the family. Uncle Pete had ten head of young'uns. When he'd drink, he'd be the happiest thing you ever seen! 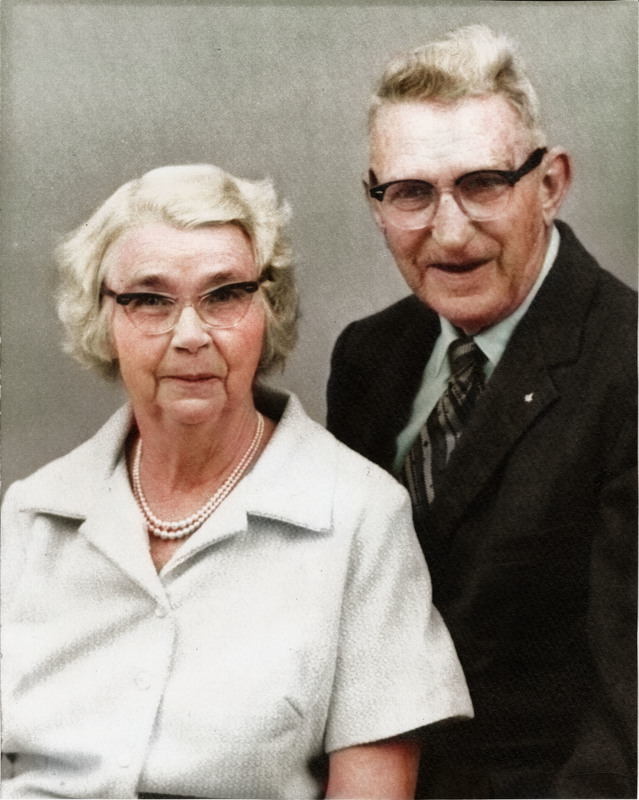 And Auntie [Lucille Hanna] married Uncle Theron. Them boys [daddy and his brothers] looked after Auntie all her life. When Granddaddy [Thomas] Hanna died, they owed money on the place. They set aside, like each one of them would have 5 acres of tobacco - already, they'd turn around and they'd plant like 5 acres they called it "for the farm." And they'd take all the money they made on that 5 acres and they'd pay on it. And they'd do that until they paid off the farm. And then they'd turn around and divide what they made and give Auntie her share too, and she didn't do a lick of nothing. And when they paid the place off, they gave her her fourth, divided among them. But I don't think she was ever satisfied, because I guess they drawed straws or something to decide who got what. Her piece all faced over on the Lake City highway. And she always told us we lived over in "Highland Park." But she had a pretty place where her house was. That house was built a little bit before daddy's house was, and it's been run down a long time. But the difference in that house and Daddy's house is they put sheetrock in that house, but they didn't keep a roof on it. Water leaking and sheet rock, it ain't gonna keep. The house here - I've had 2 roofs since Daddy and them died, so I shouldn't in my lifetime have to put another one on it. 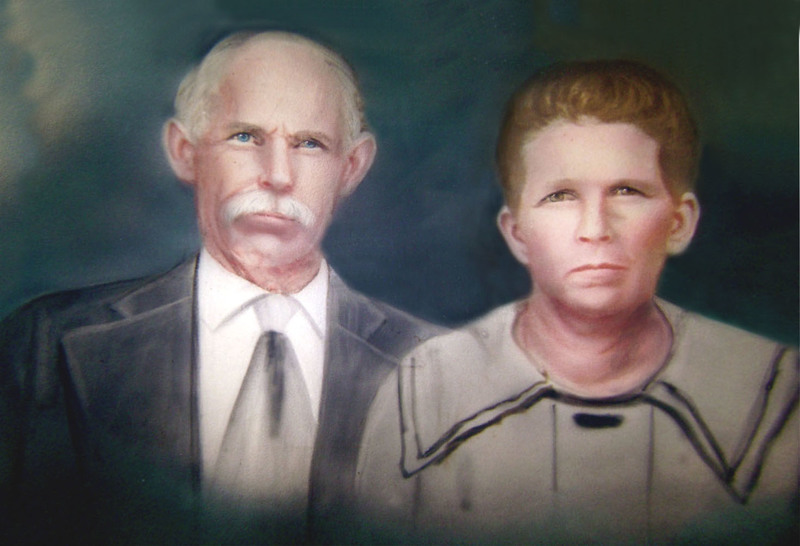 Aunt Ruby and Uncle Pete, they lived on the farm right next to us. When I was about 14 years old or so one Saturday night, they said all the children was sitting around and everything, and one of them had gone out on a date - her name was Ruby Lorraine. So they were all sitting around, and all of a sudden, somebody knocked on the door. They went to the door, and nobody was there - there wasn't no car in the yard, no lights or nothing. About 2 hours later, the police came and told them that she had been in an accident over near Lake City and hand been killed. They think that was some kind of omen or something. The Lake City Highway for as long as I could remember was paved. Uncle Barney Hanna and them lived over there. All of us young'uns had roller skates and we'd have to go over there to skate. He had like a stairway going up to that old house, and under that stairway they had a closet-like thing. And they let all us young'uns put our skates under there. When you went there, Aunt Annie always kept teacakes cooked. And she'd have those teacakes, and if you wanted milk, they always had an icebox on the back screened porch. She'd have glasses of milk - she'd put the milk in those glasses when they milked the cow, and she'd have a whole pile of those little glasses in there on a tray. And when you'd start to drink that milk, that cream would be so thick on top! They had every kind of animal just about in the world over there. Uncle Barney took in any stray, it didn't matter, you could come stay there. He had several cots upstairs, and all the boys stayed up there, and there were bedrooms downstairs that the girls stayed in. My Daddy wouldn't let me drive his car, I drove my Grandmama's car. And so when me and your Granddaddy got married, I didn't have my license. So, him and Jimmy kept me back there behind the house, they made me park in something that wasn't but this big…. And so I felt like I was ready to go get my license, so Joe said, "alright, go to Kingstree, I know the patrolman over there." And I said, well I will not. I said I'll go to Florence and get it on my own. He said, "well I'll guarantee you won't get it on your first time." I went, and I got my the first time. Didn't miss nothin'! He never did live that down. When I first met Joe Dukes? After I graduated Johnsonville, I went to live and work in Charleston. I was with my Uncle Briley and Aunt Gladys in West Ashley. I had to run Joe off! He had that old stripped down - that's what the people across the road called his car. He walked from Anson Street over to West Ashley one night. His car was broke down, and he told me he wasn't coming - and I was glad 'cause I was tired, I was working and dating him every night, so I was glad to get an early night's sleep. And here he comes walking. He did leave that night in time to catch the bus over there at Avondale. The people next door had a little fella. Joe's car made a lot of noise. Whenever he would come, that little fella would say "here comes Joe!" Joe's car - two days before we were supposed to get married and leave on our honeymoon - it slung a rod or something, and one of his buddies, Cotton, loaned us his car to go on our honeymoon. We were on our honeymoon and coming home, and this car pulled up beside us and they were just blowing their horn. We looked over and it was the man across the street, just waiving. He was at some kind of conference or something. I started at Tupperware about a month after they opened in Hemingway. Before that I worked at Wentworth and Commercial Credit in Charleston. After we moved to Johnsonville, the only place I worked was in Lake City at that sewing room, then Tupperware. When it first opened, it was chaos. Nobody knew what they were doing. And y'all, we'd make those things, and they'd say this is good, this is good, and most of them had little defects in them. And we were standing there, they were making it and we were just throwing everything away - for months and months! Finally, they got the machines lined out right. And I was the inspector. At first I'd go around to the machines. By the end, I was working in the lab and they'd bring them in there. Some of those troubleshooters didn't like me too good. It was always a big ol' building, but they only had 2 lines at first going. Once they got those, they'd add more, then more. In the lab, you had to do certain tests. If the color didn't match up you had to scrap it. They had these big machines, they'd just grind it all up and start over. They had so many good benefits. Even when I left, but when I started they had all kinds of benefits. That's the only Tupperware factory left now. I've got stuff back there in that barn, up there in the attic - they gave it to you! Every holiday - Thanksgiving, Christmas, Valentines, President's Day - they'd give you all kinds of Tupperware. Especially new items coming out. They had a child care center and everything. Your Mama got a job out there in college, but she did something in Spartanburg or somewhere instead. They had a cafeteria there - the lunch was free. They had a big recreation center - lots of good benefits. I worked on night shift I'd say 3 or 4 times, but I always worked straight day. When I was pregnant with your daddy, I got real sick. I had a tumor or something that ruptured and they thought I might die. We didn't have any other children after that - he was enough! And then we had y'all and your mama and your daddy. And your granddaddy loved y'all so much. He was such a worrier and always worried about you and Zach. You and me have traveled all over, and he and I traveled all over. We've had some good trips, haven't we? One night right after my Daddy died, I thought I heard him. He told me, he said "you've taken care of me all my life since I've been old, and you don't have to worry about a thing, cause I'll take care of you." And I never have worried, because I figured somebody was taking care of me. Now, y'all have had me all these years, and I guess y'all are going to have to let me go. I've had a good life, and I've gone wherever I've wanted to go and done whatever I've wanted to do. Promise me you won't bury me in a red dress. I want to be buried in my traveling clothes!